I've roasted a lot of chickens in my personal and professional life. Well, mostly in my professional life. Mostly because one of my first jobs in the culinary world was as a chicken roaster. That's right, I spent most of my 12-to-17 hour shifts cutting, seasoning, panning up, and roasting chickens for a restaurant that served predominantly roasted chicken. Spending years with the smell of chicken grease on my hands, clothes, and hair got me to a point where I didn't like chicken any more. In fact I went at least ten years without voluntarily having chicken after that job. 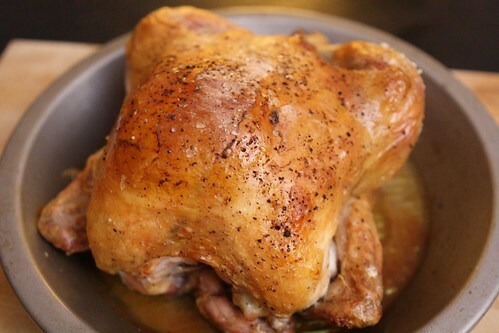 I just never had any sort of craving for roast chicken. After meeting Jen and hearing her talk, for years, about how much she loved a simple roast chicken I finally gave in and decided to give the dish another go. Since then I have found it to be quite enjoyable to have a nice roast chicken from time to time. So, tonight, I set to work to make roast chicken for dinner! 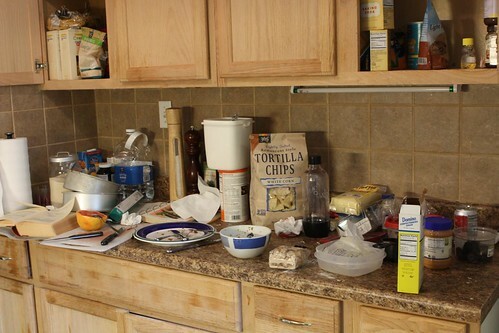 Then I saw the state of the kitchen. Jen had made a cake last night. Tornadoes are generally easier on kitchens than Jen is when she is baking. This is a mixed bag because on the one hand I have to clean up a huge mess but on the other hand there are usually delicious baked treats for me to eat. The interesting thing is her statement this morning: "I thought I did a good job cleaning last night after I was done baking. Apparently I was wrong." The morning sun casts its light on the truth. 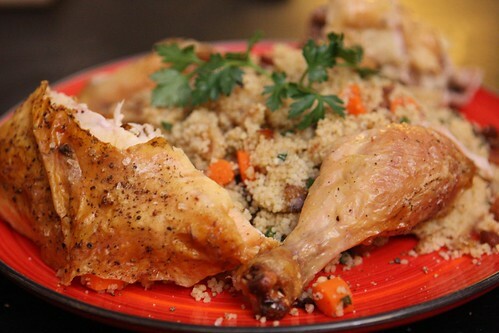 I decided, after watching a recent episode of No Reservations to break with my traditional way of roasting a chicken and go with Thomas Keller's method. I figured that it just might be possible that Thomas Keller could possess a better technique than even I had for roasting chicken. I know, this was a long shot, but life is about taking risks. It seemed to work pretty well. The main differences from my normal technique were really that this technique requires no oil, removing the wishbone, and involves a figure eight truss around the legs. Since my trussing skills are around the level of your average third grader this didn't go particularly well but once you remove the twine no one is the wiser. What did I pair with this dinner? 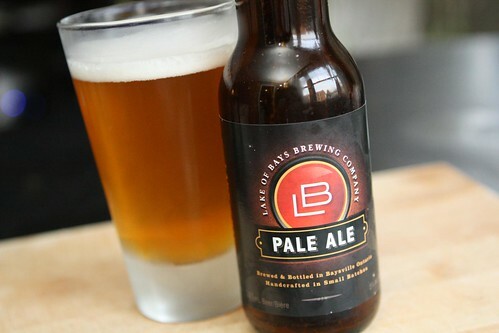 Why this pale ale from Lake of Bays Brewing in Baysville, Ontario. There is a lot on the bottle boasting about how it is a northern beer. I assumed the bay it was referring to was the Hudson Bay but it's actually less than three hours north of Toronto and an impossible distance south of the Hudson Bay. According to Google Maps there is no actual way to get to the Hudson Bay from where Baysville, Ontario is. I know that this is unlikely to be true but let's just say it's not an afternoon trip. 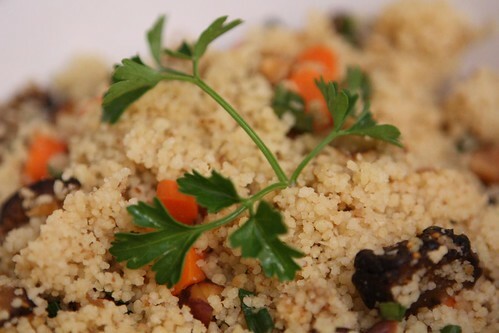 To accompany the chicken I also made this couscous with dried fig, carrot, green onion, almond, olive oil, butter, salt, and pepper. It was interesting to try an alien technique for roast chicken. I think next time I'm going to give Heston Blumenthal's roast chicken a go. All I need is a chicken and six days of prep time and I'm trying this technique out!